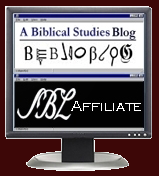 There's been a progression of comments regarding the creation of a free, online Old Testament textbook. Here's the latest from Mark Goodacre, and you can track back from that post to AKMA. There is a parallel movement in the kindergarten to high school textbook field as well as described in a recent NY Times article, "$200 Textbook vs. Free. You Do the Math." Scott McNealy (of Sun Microsystems fame) is behind a nonprofit, online hub for free textbooks called Curriki. Some aspects of the discussion are the same, but there are differences as well. The article indicates that McNealy with others "shuns basic math textbooks as bloated monstrosities: their price keeps rising while the core information inside of them stays the same." So, from their perspective and with respect to the kind of textbooks they are interested in having, the information is static. It's the cost of textbooks that is the main problem. I cannot wait for the day when my entire library is on a device like Kindle or Nook and when text books are free. My only concern is how do we convince writers, good writers and researchers, to continue to write when their is not that financial payoff in the end?